Piano Practice is a sticky subject with most piano parents. Either they have it figured out or it is a source of frustration in their week. Fortunately, there are plenty of resources out there to help! One such resource is a book by my piano teacher friend, Tracy Selle. Her book, 101 Piano Practice Tips, is available for Kindle, Kindle readers, and in paperback. The best thing about this book is the easy to read format and the inexpensive price! Every new student and parent should have this quick read read in their piano bag, right next to their first piano books. 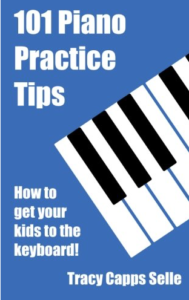 It is full of practical piano practice tips that every reader can understand. Make practice a priority. I don’t think I could possibly emphasize this enough. I would recommend treating piano practice just like any other school subject where homework is required. Without practice, there will be no improvement! With improvement, no motivation . . . .
Have your children practice right after their lesson and the very next day. Yes, do this. It will make your lives simpler if your child can better recall what they learned in their lesson. I know it is impossible to practice right after the lesson for children with evening lessons, or those who jet off to additional events and activities. That’s why I’m glad we use Practicia, where I can record portions of their lesson and they can watch at home to refresh their memory. This book is filled with great ideas that even piano teachers could use! Some of the ideas are not appropriate for every situation, but that’s why you should have a teacher guiding you and teaching you which practice strategies are best suited to what your student is working on at that time. Overall, I think this book is a must-have for any new piano parent!